Widespread E-coli bacteria that cannot be killed with the antiobiotic drug of last resort — colistin — have been found in samples taken from farm pigs, meat products, and a small number of patients in south China, including bacterial strains with epidemic potential, an international team of scientists revealed in a paper published Thursday Nov. 19 in the journal The Lancet Infectious Diseases. The scientists in China, England, and the U.S. found a new gene, MCR-1, carried in E-coli bacteria strain SHP45. MCR-1 enables bacteria to be highly resistant to colistin and other polymyxins drugs. “The emergence of the MCR-1 gene in China heralds a disturbing breach of the last group of antibiotics — polymixins — and an end to our last line of defense against infection,” said Professor Timothy Walsh, from the Cardiff University School of Medicine, who collaborated on this research with scientists from South China Agricultural University. Walsh, an expert in antibiotic resistance, is best known for his discovery in 2011 of the NDM-1 disease-causing antibiotic-resistant superbug in New Delhi’s drinking water supply. “The rapid spread of similar antibiotic-resistant genes such as NDM-1 suggests that all antibiotics will soon be futile in the face of previously treatable gram-negative bacterial infections such as E.coli and salmonella,” he said. The MCR-1 gene was found on plasmids — mobile DNA that can be easily copied and transferred between different bacteria, suggesting an alarming potential to spread and diversify between different bacterial populations. “Our findings highlight the urgent need for coordinated global action in the fight against extensively resistant and pan-resistant gram-negative bacteria,” the journal paper concludes. “Although in its 2012 World Health Organization Advisory Group on Integrated Surveillance of Antimicrobial Resistance (AGISAR) report the WHO concluded that colistin should be listed under those antibiotics of critical importance, it is regrettable that in the 2014 Global Report on Surveillance, the WHO did not to list any colistin-resistant bacteria as part of their ‘selected bacteria of international concern,’” The Lancet Infectious Diseases paper says, reflecting WHO’s inaction in Ebola-stricken African countries, as noted last September by the international medical humanitarian organization Médecins Sans Frontières. Funding for the E-coli bacteria study was provided by the Ministry of Science and Technology of China and National Natural Science Foundation of China. horizontal gene transfer. 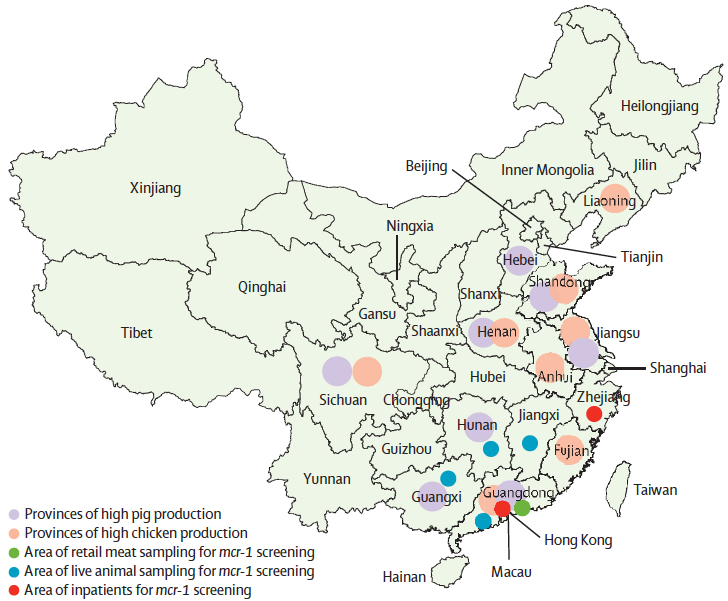 During a routine surveillance project on antimicrobial resistance in commensal Escherichia coli from food animals in China, a major increase of colistin resistance was observed. 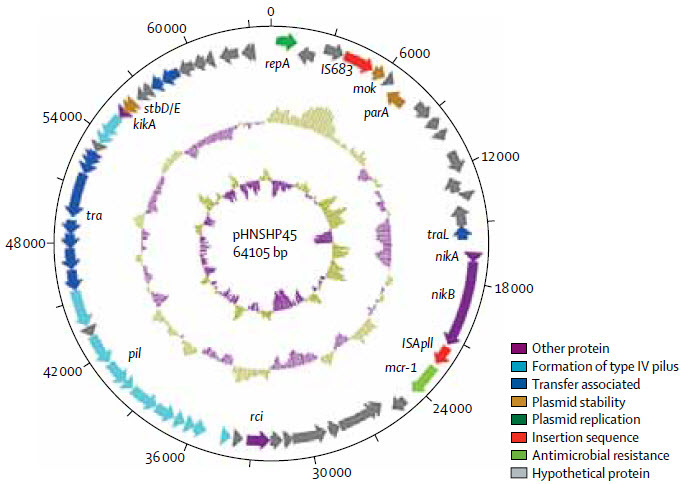 When an E coli strain, SHP45, possessing colistin resistance that could be transferred to another strain, was isolated from a pig, we conducted further analysis of possible plasmid-mediated polymyxin resistance. Herein, we report the emergence of the first plasmid-mediated polymyxin resistance mechanism, MCR-1, in Enterobacteriaceae. The mcr-1 gene in E coli strain SHP45 was identified by whole plasmid sequencing and subcloning. MCR-1 mechanistic studies were done with sequence comparisons, homology modelling, and electrospray ionisation mass spectrometry. The prevalence of mcr-1 was investigated in E coli and Klebsiella pneumoniae strains collected from five provinces between April, 2011, and November, 2014. The ability of MCR-1 to confer polymyxin resistance in vivo was examined in a murine thigh model. 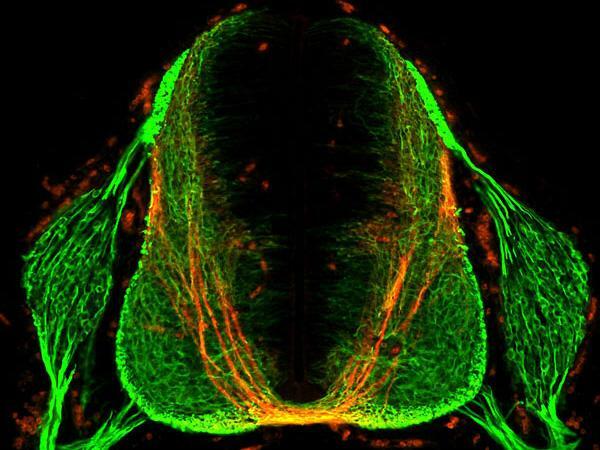 Rockefeller University researchers have discovered a molecule secreted by cells in the spinal cord that helps guide axons (neuron extensions) during a critical stage of central nervous system development in the embryo. The finding helps solve the mystery: how do the billions of neurons in the embryo nimbly reposition themselves within the brain and spinal cord, and connect branches to form neural circuits? Working in mice, the researchers identified an axon guidance factor, NELL2, and explained how it makes commissural axons (which connect the two sides of the brain). The findings could help scientists understand what goes wrong in a rare disease called horizontal gaze palsy with progressive scoliosis. People affected by the condition often suffer from abnormal spine curvature, and are unable to move their eyes horizontally from side to side. The study was published Thursday Nov. 19 in the journal Science. Axon pathfinding is orchestrated by numerous guidance cues, including Slits and their Robo receptors, but it remains unclear how information from multiple cues is integrated or filtered. Robo3, a Robo family member, allows commissural axons to reach and cross the spinal cord midline by antagonizing Robo1/2–mediated repulsion from midline-expressed Slits and potentiating deleted in colorectal cancer (DCC)–mediated midline attraction to Netrin-1, but without binding either Slits or Netrins. We identified a secreted Robo3 ligand, neural epidermal growth factor-like-like 2 (NELL2), which repels mouse commissural axons through Robo3 and helps steer them to the midline. These findings identify NELL2 as an axon guidance cue and establish Robo3 as a multifunctional regulator of pathfinding that simultaneously mediates NELL2 repulsion, inhibits Slit repulsion, and facilitates Netrin attraction to achieve a common guidance purpose. UC San Francisco researchers have discovered that even brainless single-celled yeast have “sensory biases” that can be hacked by a carefully engineered illusion — a finding that could be used to develop new approaches to fighting diseases such as cancer. The results, Lim says, suggest a whole new way of looking at the perceptual abilities of simple cells and this power of illusion could even be used to develop new approaches to fighting cancer and other diseases. “Our results may also be relevant for cellular signaling in disease, as mutations affecting cellular signaling are common in cancer, autoimmune disease, and diabetes,” the researchers conclude in the paper. “These mutations may rewire the native network, and thus could modify its activation and adaptation dynamics. Such network rewiring in disease may lead to changes that can be most clearly revealed by simulation with oscillatory inputs or other ‘non-natural’ patterns. * Chair of the Department of Cellular and Molecular Pharmacology at UCSF, director of the UCSF Center for Systems and Synthetic Biology, and a Howard Hughes Medical Institute (HHMI) investigator. ** Normally, sensor molecules in a yeast cell detect changes in salt concentration and instruct the cell to respond by producing a protective chemical. The researchers found that the cells were perfectly capable of adapting when they flipped the salt stress on and off every minute or every 32 minutes. But to their surprise, when they tried an eight-minute oscillation of precisely the same salt level the cells quickly stopped growing and began to die off. Cells must interpret environmental information that often changes over time. We systematically monitored growth of yeast cells under various frequencies of oscillating osmotic stress. Growth was severely inhibited at a particular resonance frequency, at which cells show hyperactivated transcriptional stress responses. This behavior represents a sensory misperception—the cells incorrectly interpret oscillations as a staircase of ever-increasing osmolarity. The misperception results from the capacity of the osmolarity-sensing kinase network to retrigger with sequential osmotic stresses. Although this feature is critical for coping with natural challenges—like continually increasing osmolarity—it results in a tradeoff of fragility to non-natural oscillatory inputs that match the retriggering time. These findings demonstrate the value of non-natural dynamic perturbations in exposing hidden sensitivities of cellular regulatory networks. Cardiologists from the Institute of Cardiology, Warsaw, Poland have used Google Glass in a challenging surgical procedure, successfully clearing a blockage in the right coronary artery of a 49-year-old male patient and restoring blood flow, reports the Canadian Journal of Cardiology. Chronic total occlusion, a complete blockage of the coronary artery, sometimes referred to as the “final frontier in interventional cardiology,” represents a major challenge for catheter-based percutaneous coronary intervention (PCI), according to the cardiologists. That’s because of the difficulty of recanalizing (forming new blood vessels through an obstruction) combined with poor visualization of the occluded coronary arteries. Coronary computed tomography angiography (CTA) is increasingly used to provide physicians with guidance when performing PCI for this procedure. The 3-D CTA data can be projected on monitors, but this technique is expensive and technically difficult, the cardiologists say. So a team of physicists from the Interdisciplinary Centre for Mathematical and Computational Modelling of theUniversity of Warsaw developed a way to use Google Glass to clearly visualize the distal coronary vessel and verify the direction of the guide-wire advancement relative to the course of the blocked vessel segment. The procedure was completed successfully, including implantation of two drug-eluting stents. “This case demonstrates the novel application of wearable devices for display of CTA data sets in the catheterization laboratory that can be used for better planning and guidance of interventional procedures, and provides proof of concept that wearable devices can improve operator comfort and procedure efficiency in interventional cardiology,” said lead investigatorMaksymilian P. Opolski, MD, PhD, of the Department of Interventional Cardiology and Angiology at the Institute of Cardiology, Warsaw, Poland. “We believe wearable computers have a great potential to optimize percutaneous revascularization, and thus favorably affect interventional cardiologists in their daily clinical activities,” he said. He also advised that “wearable devices might be potentially equipped with filter lenses that provide protection against X-radiation. We report a case of successful computed tomography-guided percutaneous revascularization of a chronically occluded right coronary artery using a wearable, hands-free computer with a head-mounted display worn by interventional cardiologists in the catheterization laboratory. The projection of 3-dimensional computed tomographic reconstructions onto the screen of virtual reality glass allowed the operators to clearly visualize the distal coronary vessel, and verify the direction of the guide wire advancement relative to the course of the occluded vessel segment. This case provides proof of concept that wearable computers can improve operator comfort and procedure efficiency in interventional cardiology. In a novel animal study design that mimicked human clinical trials, researchers at University of California, San Diego School of Medicine report that long-term treatment using a small-molecule drug that reduces activity of the brain’s stress circuitry significantly reduces Alzheimer’s disease (AD) neuropathology and prevents onset of cognitive impairment in a mouse model of the neurodegenerative condition. Previous research has shown a link between the brain’s stress signaling pathways and AD. Specifically, the release of a stress-coping hormone called corticotropin-releasing factor (CRF), which is widely found in the brain and acts as a neurotransmitter/neuromodulator, is dysregulated in AD and is associated with impaired cognition and with detrimental changes in tau protein and increased production of amyloid-beta protein fragments that clump together and trigger the neurodegeneration characteristic of AD. The researchers determined that modulating the mouse brain’s stress circuitry mitigated generation and accumulation of amyloid plaques widely attributed with causing neuronal damage and death. As a consequence, behavioral indicators of AD were prevented and cellular damage was reduced. The mice began treatment at 30-days-old — before any pathological or cognitive signs of AD were present — and continued until six months of age. One particular challenge, Rissman noted, is limiting exposure of the drug to the brain so that it does not impact the body’s ability to respond to stress. “This can be accomplished because one advantage of these types of small molecule drugs is that they readily cross the blood-brain barrier and actually prefer to act in the brain,” Rissman said. Rissman said R121919 was well-tolerated by AD mice (no significant adverse effects) and deemed safe, suggesting CRF-antagonism is a viable, disease-modifying therapy for AD. Drugs like R121919 were originally designed to treat generalized anxiety disorder, irritable bowel syndrome and other diseases, but failed to be effective in treating those disorders. Rissman noted that repurposing R121919 for human use was likely not possible at this point. He and colleagues are collaborating with the Sanford Burnham Prebys Medical Discovery Institute to design new assays to discover the next generation of CRF receptor-1 antagonists for testing in early phase human safety trials. Introduction: Stress and corticotropin-releasing factor (CRF) have been implicated as mechanistically involved in Alzheimer’s disease (AD), but agents that impact CRF signaling have not been carefully tested for therapeutic efficacy or long-term safety in animal models. Methods: To test whether antagonism of the type-1 corticotropin-releasing factor receptor (CRFR1) could be used as a disease-modifying treatment for AD, we used a preclinical prevention paradigm and treated 30-day-old AD transgenic mice with the small-molecule, CRFR1-selective antagonist, R121919, for 5 months, and examined AD pathologic and behavioral end points. Results: R121919 significantly prevented the onset of cognitive impairment in female mice and reduced cellular and synaptic deficits and beta amyloid and C-terminal fragment-β levels in both genders. We observed no tolerability or toxicity issues in mice treated with R121919. Discussion: CRFR1 antagonism presents a viable disease-modifying therapy for AD, recommending its advancement to early-phase human safety trials. Allen Institute researchers have identified a surprisingly small set of just 32 gene-expression patterns for all 20,000 genes across 132 functionally distinct human brain regions, and these patterns appear to be common to all individuals. In research published this month in Nature Neuroscience, the researchers used data for six brains from the publicly available Allen Human Brain Atlas. They believe the study is important because it could provide a baseline from which deviations in individuals may be measured and associated with diseases, and could also provide key insights into the core of the genetic code that makes our brains distinctly human. While many of these patterns were similar in human and mouse, many genes showed different patterns in human. 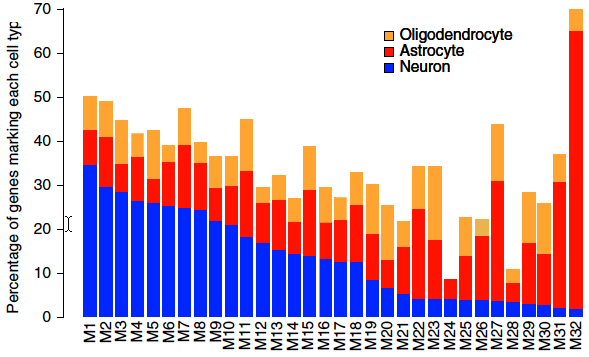 Surprisingly, genes associated with neurons were most conserved (consistent) across species, while those for the supporting glial cells showed larger differences. The most highly stable genes (the genes that were most consistent across all brains) include those associated with diseases and disorders like autism and Alzheimer’s, and these genes include many existing drug targets. These patterns provide insights into what makes the human brain distinct and raise new opportunities to target therapeutics for treating disease.